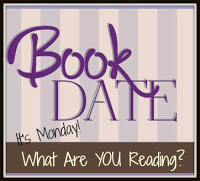 Book By Book: It's Monday 1/7! What Are You Reading? Hello, Monday! I am in the midst of attempting to set up the new laptop I got for Christmas but running into all kinds of problems - first it wouldn't accept my WiFi password, then it wouldn't accept my Apple ID password, then I got the Spinning Beachball of Death (anyone with a Mac knows what I mean!). So, I finally got it to accept my WiFi password, and....yay! I just reset my Apple ID password and got past that hurdle, too. And now it's transferring my data from the old MacBook Pro to the new one - whew! That was much harder than it should have been. Which pretty much describes last week. Not quite the week I had planned, though I did manage to squeeze in a bit of my annual look back at the old year and begin planning for the new year. My younger son came home on New Year's Eve with a high fever and killer sore throat. Five days and three antibiotics later, and we saw the doctor on Friday, who said it looked like he had strep throat plus tonsillitis plus a very painful abscess on one tonsil, and maybe mono, too! Yikes. I'm happy to report that antibiotic #3 and a short blast of steroids did the trick (and we don't think he has mono), and he is feeling much, much better and packing to move back to his house at school today. I finished reading - and thoroughly enjoyed - Less by Andrew Sean Greer, which won the Pulitzer Prize for fiction in 2018. I found that surprising because it's humorous, and I typically think of Pulitzer Prize-winning novels as serious tomes. But it was wonderful, about a middle-aged gay writer who sets off on a round-the world trip for his 50th birthday to avoid attending the wedding of his ex-lover. It's one of those "everything that could go wrong does" stories, though the things that go wrong are often bizarre, unexpected things. It has more emotional depth to it than you'd first think and is thoughtful, but it is also laugh-out-loud funny in every chapter. Now, I am reading a review book (due out in February), Finding Dorothy by Elizabeth Letts. It's based on the true story of how Maud, the wife of the late L. Frank Baum, author of The Wonderful Wizard of Oz, got involved as a consultant (she basically forced her way in!) on the famous movie version of the book in 1939. There are all kinds of entertaining details about the actors and the production, and especially about 15-year old Judy Garland in the lead role, but the novel also goes back to Maud's own childhood in New York State (where I grew up) and recounts her experiences with a strong, suffragette mother (she called Susan B. Anthony "Auntie Susan"), how she met Frank, and her own experiences as a mother. I am loving this book! I am still listening to a middle-grade audio book, The Parker Inheritance by Varian Johnson. I was hoping to squeeze in a short audio by the end of the year, but this is actually a fairly long middle-grade novel...so it is my first audio of 2019! It's the story of a young girl named Candice in South Carolina whose recently deceased Grandma left behind a puzzle for her to solve that could lead to a fortune. Candice befriends the boy across the street who loves to read as much as she does, and the two of them learn about the town's history while following the clues. It's a wonderful mix of mystery and history, and I'm enjoying it. My husband, Ken, finished Here and Now and Then by Mike Chen, which I had just finished reading and reviewing. He enjoyed it but didn't love it as much as I did (it is pretty much my ideal novel, and I love time travel plots, so that makes sense). Ken needed a quick book to read before he heads off on an extensive trip to Europe, so he is reading one of his Christmas gifts from our son, Past Tense by Lee Child, the latest Jack Reacher novel. This is his favorite series and his favorite author, so he is enjoying it very much! I believe our son, Jamie, 24, is now reading the FINAL book 14 of The Wheel of Time series, A Memory of Light by Robert Jordan and Brandon Sanderson. I was wrong when I said he finished the series with book 13 - there is one more, weighing in at a hefty 1168 pages! He loves this series and has been looking forward to the conclusion. Movie Monday: Bohemian Rhapsody - SO GREAT!! I laughed, I cried, I sang! Excited it won Best Drama and Best Lead Actor in the Golden Globes last night - well deserved. I'm so happy to hear you enjoyed Less. I'm looking forward to reading it and am especially glad to hear of all the humor. I agree that The Parker Inheritance was on the long side for a middle grade novel, but oh how I enjoyed it. :) I would like to read my first Brandon Sanderson book this year. I hear the name ALL the time and feel like I'm missing out. Thanks for all the shares, Sue! Hope you enjoy Less! I am almost finished with The Parker Inheritance now - mystery solved! Hope you like Sanderson - he is one of my son's favorites! I do hope all your computer problem gets solved soon. Transferring everything over and remembering passwords is a reason I keep my computers a bit longer than I probably should. Finding Dorothy sounds good. Come see my week here. Happy reading! Same here, Kathy!! I kept my old one for over 10 years, until the latest software would no longer work on it :( I'm still struggling with problems - now half of my Mail folders are missing. I'm giving up for tonight - will try again tomorrow! Happy that things are better with your son. Life happens, doesn't it? I have 'Less' on my list & will hopefully get to it soon, but am also reading for the Cybils awards, a lot of reading going on! Happy New Year, Sue! yes, Bohemian Rhapsody is a must-see! Interesting that your hubby and I are more aligned on Here and Now and Then. I do like time travel though - think Outlander and The Dream Daughter I am listening to is time travel. My word your son had a lot to contend with. I like the sound of Less by Greer, very brave to set out by himself. Less was lots of fun - and sweet, too. Great novel! I had my library order Finding Dorothy and it should be in soon. I want to see Bohemian Rhapsody. Oh, good, Vicki! I am really loving Finding Dorothy - hope you do, too. It hasn't been released yet - it comes out about a month from now in feb. Setting up a new computer should be so much easier and I totally understand the spinning beachball! I had strep throat just before Thanksgiving and over Christmas took care of my mom who got pneumonia (yep, antibiotics and steroids). Glad to hear your son is feeling better. Yes!! Still struggling with new laptop problems - so frustrating! That's right - I forgot you had strep, too. This was a nasty one - didn't respond to the first 2 abx he tried. Hope your mom is better now. Yes, great books help with all of life's other woes! I;m almost finished with The Parker Inheritance now - the mystery has been solved! Parker Inheritance is on my Must Read in 2019 list--I so look forward to it! And good luck with your new computer! Happy reading this week, and a happy new year! Thanks, Kellee - turned out to be a very looooong week of computer problems, but I am back online and on e-mail now, so almost all set (one remaining problem!). Almost there, thanks to 90 min at the Genius Bar last night - I love those guys! Back online and on e-mail, with just one remaining problem. Long-time Mac user, so I completely understand the spinning (pizza) wheel comment. I wish I had known about getting outdated from programs. I had started a personal book database (prior to there being GoodReads). At some point I couldn't access it any longer. Turned out I had updated past the application where I had the data base. I had discovered I was unable to print from my laptop. My son, who is about to graduate with a Computer Science degree, said he couldn't help me with networks. All he could suggest was to turn my computer off then back on. I turn it off every night. My situation hadn't changed in days. Today I asked my husband to turn the printer off and then back on. THAT WORKED! Phew! I'm going to need to publish pages for a cookbook soon. Glad I don't have to worry about how I was going to manage that. Now I am back online and back on e-mail - big relief! Though now my Sent folder is missing on e-mail. I'm not messing around this time - back to the Genius Bar! Glad you got your problem sorted out! Are you publishing a cookbook? I was so surprised to hear that some people didn't like it! I guess humor is very individual. Glad you enjoyed it, too. I wish I could get hold of your Pulitzer prize winning book. It sounds very intriguing. I'm sure your library has plenty of copies!